To share any info your have on backcountry skiing at Rogers Pass, or to get the lowdown from others, check out our backcountry skiing forums on the region. 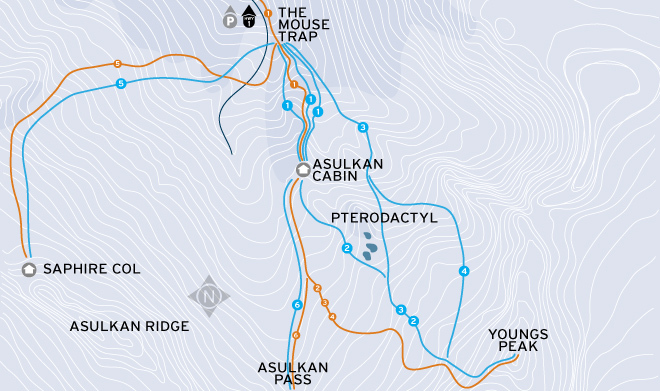 There is a large collection of routes to ski at Rogers Pass so we have grouped them by their location in the Asulkan Valley and then listed other routes in the Pass next, below. Note that the route descriptions for the areas other than the Asulkan Valley are a little “thin.” For more detail, speak to a local ski guide in-the-flesh, or consult one of the area guidebooks. If you’d like to contribute more detail to these or other Pass routes, please go to our Submit a New Route page and share your info. It’d be appreciated! Though the ski touring around Rogers Pass may not fit into the established “slackcountry” mould, the access and quality of skiing terrain is good enough that we’d like to share it. It’s also spitting distance from Revelstoke and Golden, and half a day’s drive from Nelson. Rogers Pass is known as one of the premier ski touring destinations in North America and, more and more, people from all over the world are visiting to check out the legendary snow, big mountain feel and massive terrain selection. For more information on Rogers Pass, check out the Parks Canada site. For info on avalanche hazard, look to the avalanche bulletin. Enjoy the routes listed below that start out of the Asulkan Valley but look farther down the page for more classic routes around Rogers Pass that you will not want to miss. If you plan to tour in Glacier National Park, be aware that many areas of the park have restricted and prohibited access in winter — which are defined and managed within the Winter Permit System, a component of the Highway Avalanche Control Program. 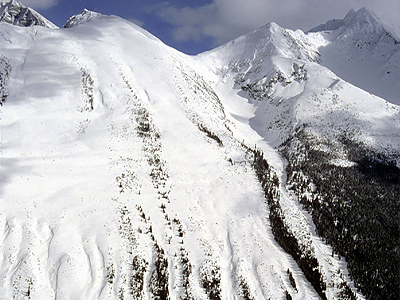 The system allows backcountry users, with permits, to enter Winter Restricted Areas that are affected by the highway avalanche program when artillery gunfire is not anticipated. This system protects the public from the danger of direct artillery fire, including fragments that can travel up to 1000 metres, and the resulting avalanches. Before you go visit pc.gc.ca/skirogerspass to find out more. For the routes we describe here, we assume that you are doing a day trip rather than staying at the Asulkan Cabin. If you’d like to recharge your batteries and start the day at 2100m (6890’), you can reserve the cabin through the Alpine Club of Canada. Note that the elevation gains listed here are from the parking lot off the highway at the beginning of your skin up. To access all the routes described here, start at the parking lot just off the highway (this lot serves the Wheeler Hut also), climb up the steep slope to the left of the small utility buildings through the trees for approximately 50m until you join an old railway road. Turn left onto the road and follow it for a just under a km. When the trail bends east at a big open space, the trail splits right off this road (continue left and you’ll reach the Wheeler Hut). From here, the uptrack leads you along the Asulkan Creek up through varied terrain—avoid the two forks going left and continue on the main trail. There are several avalanche slopes along the way and this section of the tour finishes with the Mousetrap—a particularly hazardous terrain trap. 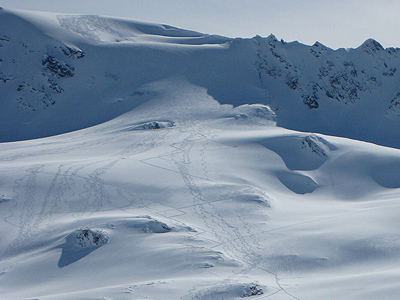 Good avalanche safety skills and a close reading of avalanche reports beforehand are essential. From below, to access the Tree Triangle, exit the Mouse Trap and head slightly looker’s left up over a roll until you get to the edge of the trees you see directly in front of you. There may be an uptrack set already. If not, set one yourself, heading up through the trees. Continue up until you break out of the trees (about 30-45 mins from where the trees began). From there, you can opt to continue up and over a small, steep and treeless knob—which you’ll see directly in front of you—for more vertical gain, or simply turn around and begin your decent. The skiing anywhere through the Tree Triangle is good. Be aware that if you head to either far skier’s right or left, you may encounter some rock bands, surprise drops or much steeper terrain. Your route choice will also determine how close you are to the uptrack when you get to the bottom of your run. Heading skier’s right can force you down toward the mouth of the Mousetrap. By going left or to the centre, you have the option of stopping at the edge of the trees and doing quicker yo-yos. 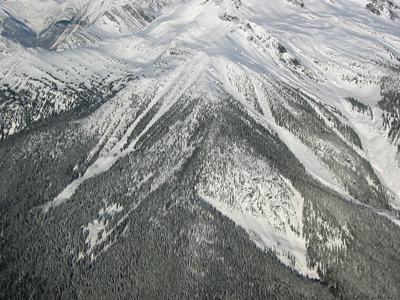 The Tree Triangle is ideal to ski in times of high avalanche danger and poor visibility. If it looks skied out, poke around a bit—there are a remarkable number of lines available. To access the Pterodactyl run, tour up through the Tree Triangle as we’ve described in that section. Continue up, over the knob after the trees and on to the final ascent to the Asulkan Cabin. Though the cabin may be full of “overnighters” it’s an excellent rest and reset spot if you feel so inclined. The Pterodactyl is the rock feature that pokes out prominently slightly above and east of the cabin. The first part of the ascent for this tour, after the cabin, is the same as that for the Seven Steps of Paradise tour. Continue up until you come to the Young’s Peak headwall which you’ll notice because it’s so steep. This is a decision point where you can continue up to Young’s Peak or turn around and ski slightly toward the west, skier’s left of the Pterodactyl , all the way back down to the cabin. There are many moraine features in here—some of them quite steep, some not so steep. If the conditions are right, hugging the Pterodactyl to your left offers up a great shot back to the cabin. To access the Seven Steps of Paradise, tour up through the Tree Triangle as we’ve described in that section. Continue up, over the knob after the trees and on to the final ascent to the Asulkan Cabin. Though the cabin may be full of “overnighters” it’s an excellent rest and reset spot if you feel so inclined. To get to the seven steps, continue up above the cabin over not-too steep rolls and moraines. As with the tour we call Pterodactyl, continue to the base of the Young’s Peak headwall and decide whether continuing up is a viable option. As well as being steep and sometimes icy, the headwall often slides. All these factors are compounded if the visibility is poor. If it looks good, you have the skills, and conditions permit, proceed with caution up the headwall—far looker’s right may be the best option. Perhaps go one at a time here and remember that an old track doesn’t mean a safe track. The final 1/3 of the headwall may require a boot pack, depending on conditions. There is a bit of a false summit and then the actual Young’s Peak presents itself along with breathtaking views of the Illecilewaett Neve to the east and south. For the descent, ski over the seven steps (but who’s counting) keeping the Pterodactyl to your left and enjoying the full 1219m (4000’) ski down the valley bottom. Feeling energetic still? Consider another lap! To access the route we call “Paradise” (because it’s like that), the ascent is the same as for Route #2, The 7 Steps of Paradise. Excuse the repetition: tour up through the Tree Triangle as we’ve described in that section. Continue up, over the knob after the trees and on to the final ascent to the Asulkan Cabin. Though the cabin may be full of “overnighters” it’s an excellent rest and reset spot if you feel so inclined. To get to Paradise, continue up above the cabin over not-too steep rolls and moraines. As with the tour we call Pterodactyl, continue to the base of the Young’s Peak headwall and decide whether continuing up is a viable option. For the descent, ski back down and toward the east, skier’s right. This is all alpine terrain here so there are many ways down. Going to the extreme right brings you to a great slope adjacent to massive rock wall running down half the length. The slope is gentle and it’s wide open—kind of like what heliskiing must feel like. Be very aware of avalanche conditions and open crevasses as the lower section includes a small glacier. This route, like the 7 steps, is also about 1219m (4000’) down to the base of the Tree Triangle. Yesssssss. The Sapphire Col is another classic tour within the Asulkan Valley—it also offers an incredible number of skiable lines. As soon as you exit the Mousetrap, angle toward the west and set an uptrack if one isn’t already there. Avoid the exposure in going up the middle of the avy path, and head looker’s right into the trees. Zigzag up west and continue along a spine until you get out into the open alpine again at the Triangle Moraine. From here, tour towards the west climbing all of the steps safely until you eventually arrive where it flattens out well below the col. Use the prominent rock band on your right-hand side as a hand rail - remember you may have to get back down if the weather turns and the lack of any features here makes getting lost easy. Don’t hug the rock wall too close as it can sluff off snow, rock, ice etc. You will eventually come to a very steep slope before the low-angle slope just before arriving at the col and the tiny little shelter known as the Saphire Col Hut - this is a decision point based on current conditions and the groups knowledge and experience. At the Col don’t expect much other than the near-constant high winds, the windowless box cabled to the rock is best reserved for emergency situations. Like the Asulkan Cabin the Sapphire Col “Hut” can also be booked through the Alpine Club of Canada. The col—between The Dome and Castor Peaks—offers up some amazing views. Skip it if you are more interested in the descent and rip off your skins earlier, where it begins to flatten out. The mellowest (and perhaps safest) slope down is skier’s left, near the rock wall. For more challenging terrain, consider heading more skier’s right—but ski with caution, this is glaciated terrain with open crevasses and other dangerous features. Look out for a triangle moraine feature about maybe 3/4 down. It’s an excellent pitch and seems to hold the snow well. Whatever your route, consider keeping your uptrack in view for the descent and carry the proper crevasse rescue gear - and know how to use it. The Asulkan Pass route is one of the mellower options in the valley. It does require you to go above the Asulkan hut, so hope for a clear day when conditions are right. To access the Asulkan Pass, tour up through the Tree Triangle as we’ve described in that section. From the Asulkan Cabin, skin up more toward the west (skiers’ right) than for the other routes we describe here. Continue up the low-angled slope and head to the big saddle lookers right [way right] of Young’s Peak. The beauty of this route is that you skin up what you ski down so you can pick out your lines easily. Continue up until you come to the Asulkan Pass and some great views to the south. Rip ‘em and head back down more-or-less the way you came up. If you are staying at the cabin, this route is a perfect warm-up run or an option when time and energy is limited. This is a good tour for a short day but must be left till later in the season when the snowpack is deep. Otherwise it could be a bit of a thrash. For this tour you need a permit which can be obtained at the Rogers Pass Discovery Centre. Begin the tour immediately behind the parking lot at the Rogers Pass Discovery Centre (trail sign). Climb a steep trail for about 580 vertical meters up the shoulder of the Cheops Mountain. Eventually the trees thin and the trail levels. Here you pass several signs that says the area is closed (in other words you must have a permit). Traverse left for about 2-300 meters on a bench until it opens up. Above you in a large bowl and below a sparsely treed old avalanche slope. Descend straight down. Sometimes the skiing is open and sometimes a little tight. After about 300 vertical meters the big trees begin again. Stay right and descend the glades to the valley. The skiing is excellent, sometimes steep, sometimes open and sometimes tight. Just before you reach the highways you cross the old CPR rail line. Turn left and follow it back toe the Discovery Centre. 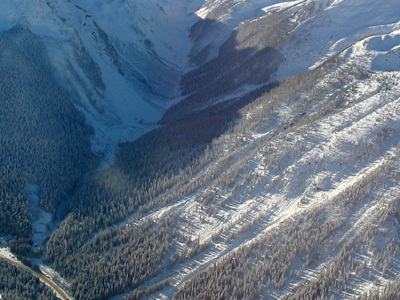 The NRC Gullies are the impressive looking lines above the Trans-Canada Highway, on the west shoulder of Mount MacDonald, just west (south) of the Rogers Pass Discovery Centre. Despite their frightening appearance they make great skiing and are very popular. A permit is required which can be obtained at the Rogers Pass Discovery Centre. Drive west (south) from the Discovery Centre for about 1.5km and park on the left (east) side of the highway in a cleared lot. Climb over the snowbank, cross a creek and ascend directly above. This is one of the most popular ski touring trips in Rogers Pass due to the proximity to the highway and variety-pack of ski terrain. A little over 200 m from the Balu Pass trailhead there is a bridge crossing. Take this crossing and follow the valley bottom until you reach the first major avalanche path. Enter the forest here and climb steadily working up the shoulder until you hit the alpine and a well-defined shoulder leading towards Little Sifton. 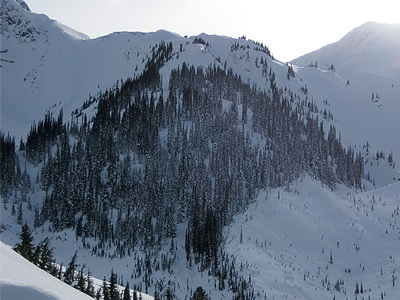 There are several descent route options; these are best described in Ski Touring in Rogers Pass by Eric Dafoe, John Kelly, and JP Kors, otherwise you can ski down through the trees towards the highway. ACCESS: Start from behind the Glacier Park Lodge on the north side of Hwy 1. Although considered one of the easiest trips, the Balu Pass trail travels through several large avalanche runout zones which give this trip its Complex avalanche terrain rating. This trip tends to be a popular early-season destination due to a combination of a high elevation start and a lack of alder on the summer trail. Begin at the Balu Pass trailhead, take the first bridge crossing and follow the valley bottom until you hit the first major slide path coming from Grizzly Shoulder. Options from here include taking the low road around the fan and stick to the trees on the north side of the valley or follow the valley bottom (snow stability dependent) until you reach the Pass. Gentle ski options are available back down towards your uptrack or on the shoulder leading north from Balu Pass. If you like open gladed skiing then this is a great choice, especially with poor visibility or flat light skiing conditions. From the Balu Pass trailhead, cross the bridge and continue along the valley bottom until you reach the first major slide path. 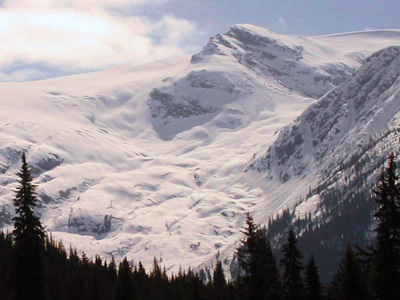 Continue across the large fan and stay on the north side of the valley for approximately 3 km until you traverse below what is referred to as the “Christmas Trees” (remnants of a large avalanche). Across this traverse you will reach mature forest on your right – begin switch-backing up and right, towards the Christmas Trees. Eventually you will reach Hospital Bowl. Head east across the top of Hospital Bowl until you reach a treed ridge = Ursus Trees. You can continue upward through the forest or scout out your ski line and begin your descent. 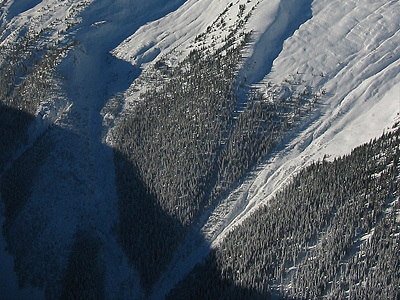 For more details refer to Ski Touring in Rogers Pass by Eric Dafoe, John Kelly, and JP Kors. So named because of the short, easy travel time and a chance to become oriented to skiing in the Pass. Although they’re called the Practice Slopes, you are required to travel through large avalanche paths in order to reach these slopes. Follow the abandoned rail grade from the Illecillewaet parking lot to the Asulkan Trail which forks off to the right. Take the 2nd left off of the Asulkan Trail, following the trail signs for the Great Glacier Trail. This trail crosses a bridge and travels through forest until you reach the Illecillewaet River. Cross the River and follow the bank until the valley becomes more open. Roughly 1 km up from here you will see two large and distinct avalanche paths on your left. These are the Practise Slopes. 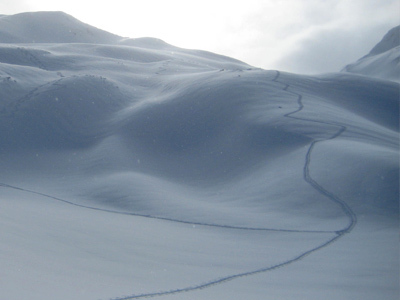 For more details refer to Ski Touring in Rogers Pass by Eric Dafoe, John Kelly, and JP Kors. ACCESS: Start from Illecillewaet /Asulkan parking lot which is 3.5 km west of Roger Pass. This trip can be done as a loop between the Illecillewaet and Asulkan Valleys or simply a there and back trip. It can offer an easy day trip in good visibility or a route-finding challenge in a whiteout. Follow the abandoned rail grade from the Illecillewaet parking lot to the Asulkan Trail which forks off to the right. Take the 2nd left off of the Asulkan Trail, following the trail signs for the Great Glacier Trail. This trail crosses a bridge and travels through forest until you reach the Illecillewaet River. Follow the southeast bank until the valley opens up. Begin climbing the obvious moraine feature below and to the climber’s right of the Illecillewaet Glacier. Note that this terrain quickly becomes complicated and the best route tends to trend to the climber’s right. From the moraine, you have a clear view of Lookout Col (visibility dependent) and can ascend to the col, keeping towards the middle of the valley. From the col, you can ski back down the way that you came or down the steep west-facing slopes and into the Asulkan Valley where you can join up with the Asulkan Trail. 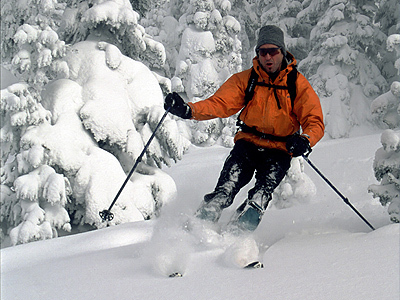 For more details refer to Ski Touring in Rogers Pass by Eric Dafoe, John Kelly, and JP Kors. 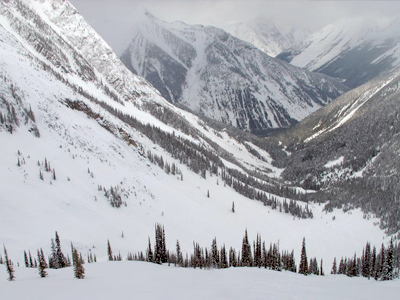 Some consider this an ideal day tour in Rogers Pass due to the steep and north/northwest-facing slopes above treeline that are skied back to valley-bottom. Take the valley floor until you see a band of trees coming off the shoulder of Terminal Peak. Ascend towards these trees until you see a picturesque frozen waterfall on your right. Climb the right hand side of this waterfall and follow the terrain trending southwest. Be aware of the large slopes above coming off of Terminal Peak and stay right of any features that you must climb unless the hazard dictates turning around. Descend back down the way that you came up or on steeper slopes on the skier’s right (closer to Terminal Peak) until you reach the waterfall, at which point you will want to follow your original uptrack. 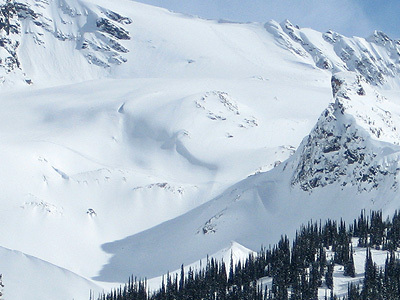 For more details refer to Ski Touring in Rogers Pass by Eric Dafoe, John Kelly, and JP Kors. This area is especially good for tree skiing on the west-facing slopes of Mt McGill and McGill Pass. From the Bostock Trailhead, follow the trail until the first switchback to the left and head up the ridge proper of the shoulder until the ridge begins to narrow, the trees peter out, and the top of the shoulder can be seen. From 1900m onwards, good ski lines can be had down the west-facing slopes (the mellower descents are further to the skiers left). 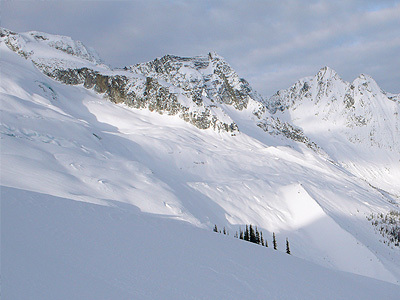 For more details refer to Ski Touring in Rogers Pass by Eric Dafoe, John Kelly, and JP Kors. This trip is worth the distance (6-7 km one-way) given the normally untracked snow and variety of slope angles. Follow the Bostock Trail until you reach an elevation of 1345m/4400ft (roughly 5km from the trailhead) at which point you will come to a junction of two creeks above the trail. Continue across the creek and trend upward and left through forested area. Soon you will see McGill Pass on your right; you can either ski down from where you are (trending left) or ascend to the Pass and ski down from there (again trending left). 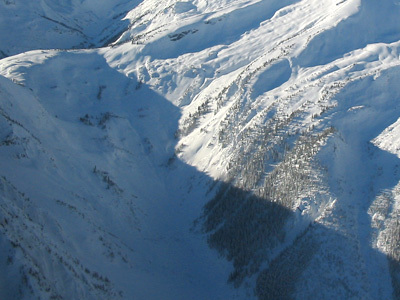 For more details refer to Ski Touring in Rogers Pass by Eric Dafoe, John Kelly, and JP Kors. 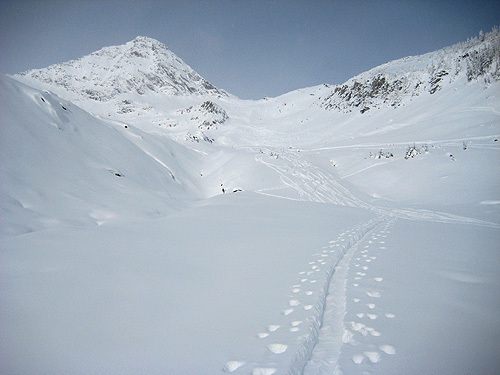 This route is a popular Rogers Pass early season ski touring destination. A combination of easy access and relatively few hidden obstacles and dangers in the early season snow pack make the 8812 Bowl more viable than other touring options in the area if you hit it before significant accumulation. This route takes skiers through several large avalanche runout zones which explain its Complex avalanche terrain rating-caution is required. Begin at the Balu Pass trailhead behind the Glacier Park Lodge. Take the first bridge crossing and follow the valley bottom until you hit the first major slide path coming from Grizzly Shoulder. Stick to the trees on the north side of the valley (following the summer trail) until you reach the western end of the valley where, looking north, you will have a clear view of 8812 bowl. Caution is needed here as this is a large run-out zone in high avi danger. Tour up the bowl using islands of safety and one person at a time until you reach the saddle directly below and to the east of the summit of 8812 peak. Now - enjoy the ski and follow your route back down to the hot tub at the Glacier Park Lodge. The dramatic north side of Mount Bonney up the Loop Brook Valley offers a good variety of north facing skiing with an alpine ambiance. The apron below the Bonney glacier moraines, west of the Loop Brook, provide many tree skiing options ranging from low angled glades to steep open planar slopes and pillow lines. 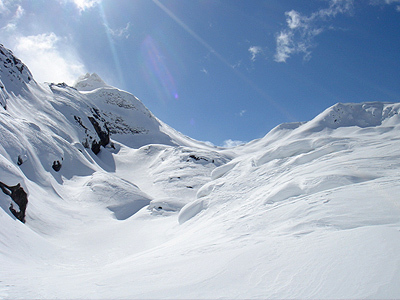 Above the moraines, sections of the glacier yield moderate angled alpine turns when visibility and the avalanche hazard are aligned. The access route up the Loop Brook crosses two avalanche control winter restricted areas; Loop & Ross. A valid Winter Permit is required to park a vehicle or ski in this area. Permit holders can only ski here on days when the area is posted as open, this means there is no chance of artillery fire happening in the area. Permits can be obtained at the Roger Pass Visitor Centre. For more info, visit the Glacier National Park website. Start from the Loop Brook winter parking area located on the south side of HWY #1 about 6.5 kilometers west of Rogers Pass. Make sure the area is open to skiing that day and that you have proper permit in place. For this area to be skiable there needs to be about 1 metre of settled snow at the highway elevation. Start by ascending along the east side of the Loop Brook in a southerly direction via a mixture of tight trees, open avalanche run out zones and old growth cedars. After two kilometres, you will see a narrow slot canyon and valley coming from the west below the southeast side of Ross Peak. From this creek junction, ascend a narrow shoulder (the Elephant’s Trunk) between the two creeks in a southwesterly direction. Continue along this shoulder in a southerly direction to the first main rock band. Contour around this on the lefts (south) side along a small bench and ascend the treed shoulder above more directly towards the Bonney Glacier. The trees are pretty tight at first but eventually open up with elevation and at around 1800m the steeper moraines will come into view. If the conditions justify carrying up the moraines, there is a slightly lower angle ascent route up and left to a break in the moraines at NAD 27 Grid 620-747. From here, continue up in a westerly direction to the highest moraine at 2050m. If you have the energy, the conditions and visibly warrant, an ascent of the Bonney glacier can be made. Proper glacier travel techniques, equipment and crevasse rescue skill are mandatory on this section. From the highest moraine below the glacier ascend in a southwesterly direction to about 2450m or NAD 27 Grid 607-738 roughly 600m north of Parsons Peak. Beware of large steep slopes and cornices above your location, stay away from the potential run out zones. Hopefully by now you have had a chance to scope out your descent options. The safest descent from here and back to your vehicle is done by retracing your steps. Depending on the conditions, there are some interesting variations. 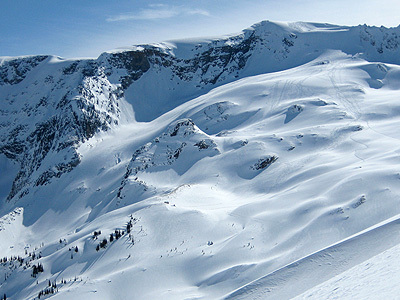 The steeper flanks of the moraine slopes can provide some exhilarating turns when right. The skiers left side of the moraines and trees boast some very steep lines with a mixture of steep planar slopes and pillow lines. These lines should only be attempted by a strong team when the conditions and visibility are aligned.